Photography as an art form began with the influence of Alfred Stieglitz, who had organized the Photo-Secession group, which promoted a “painterly” style of photography. 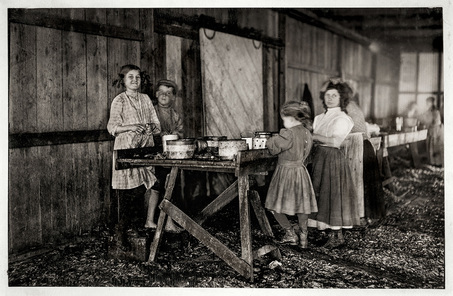 The characteristics of this type of photography were romanticized images produced in a “soft-focus.” Trickery of the actual image-making and its production were the heart of creating this type of photography. 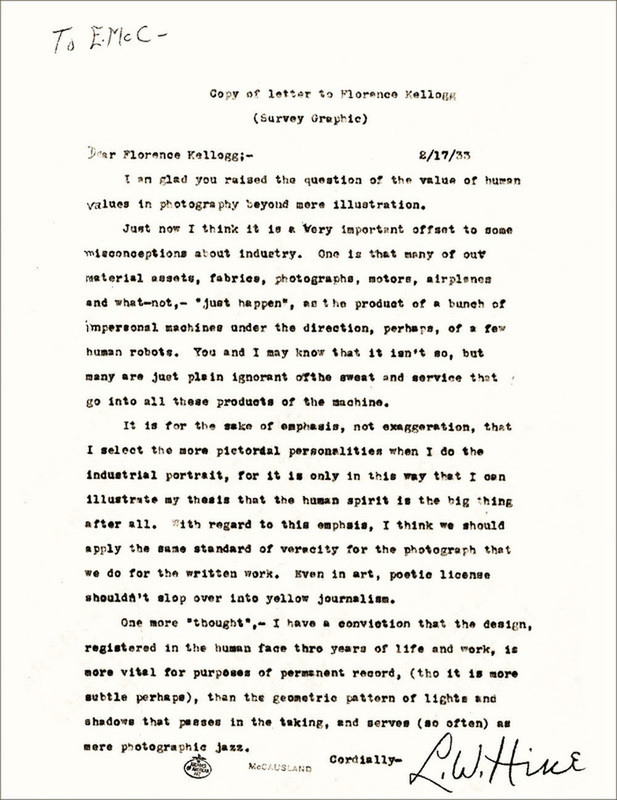 Hine once questioned the group's artistic methods, from their ivory tower, how could they see way down to the substrata of it all? 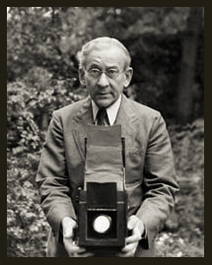 Hine, from the beginning, considered his photography as an educational tool in addition to an art form. ​"The incident I am about to relate is one that has often occurred to sailors-boys before my time, and no doubt will occur again, until governments make better laws for the regulation of the merchant service, with a view to control and limit the far too absolute power that is now entrusted to the commanders of merchant-ships. It is a positive and astounding fact, that many of these men believe they may treat with absolute cruelty any of the poor people who are under their command, without the slightest danger of being punished for it! 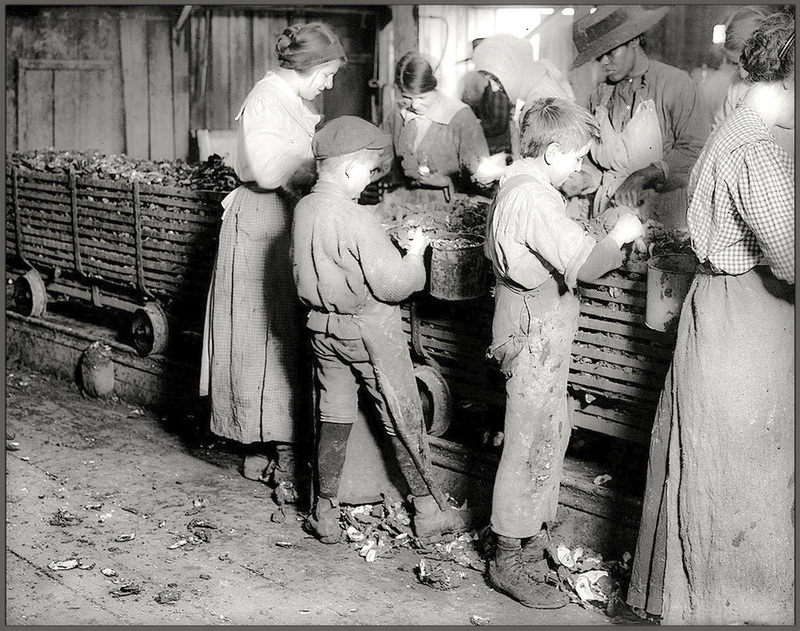 In the United States it took many years to outlaw child labor. 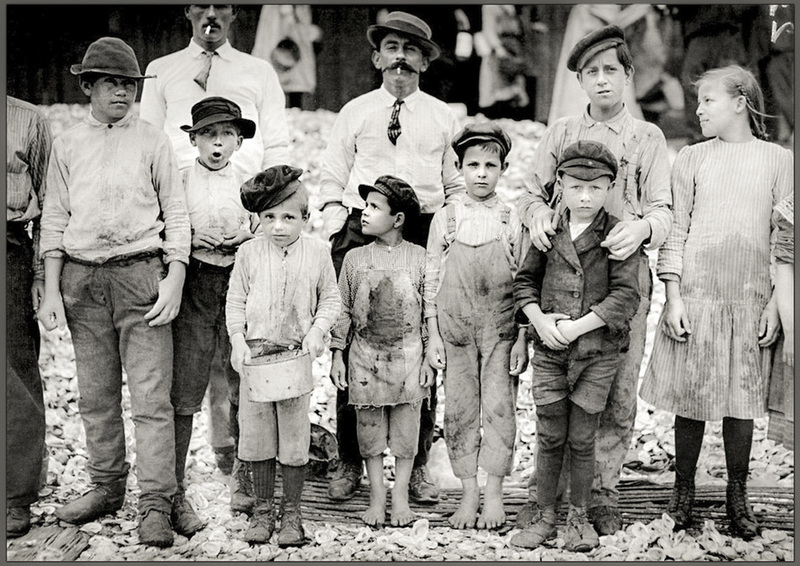 By 1899, 28 states had passed laws regulating child labor. Many efforts were made to pass a national child labor law. The U.S. Congress passed two laws, in 1918 and 1922, but the Supreme Court declared both unconstitutional. 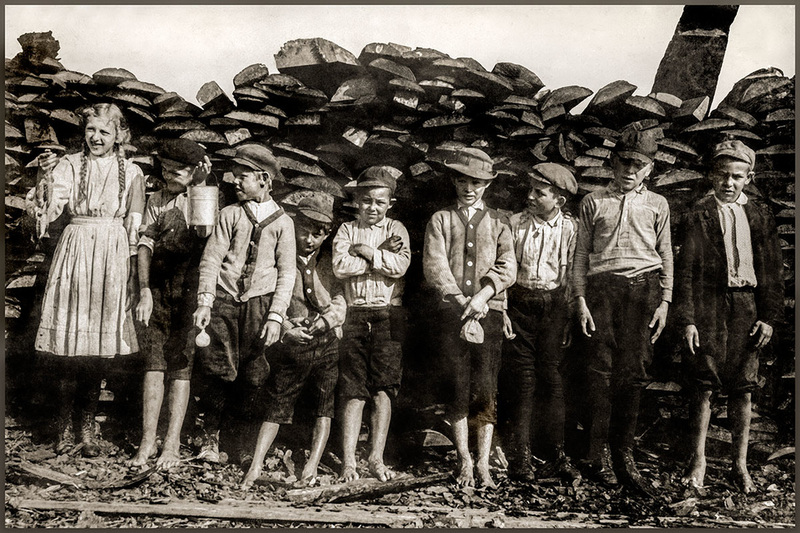 In 1924, Congress proposed a constitutional amendment prohibiting child labor, but the states did not ratify it. Then, in 1938, Congress passed the Fair Labor Standards Act. It fixed minimum ages of 16 for work during school hours, 14 for certain jobs after school, and 18 for dangerous work. Today all the states and the U.S. government have laws regulating child labor. These laws have cured the worst evils of children working in factories. 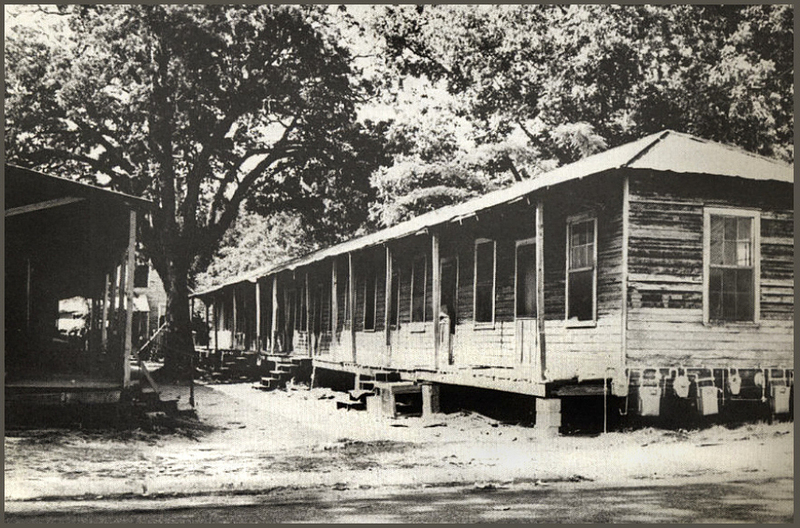 By the 1911 date of the Hine photographs, one can see that the law was ignored by the owners of seafood canneries on the Mississippi Gulf Coast. 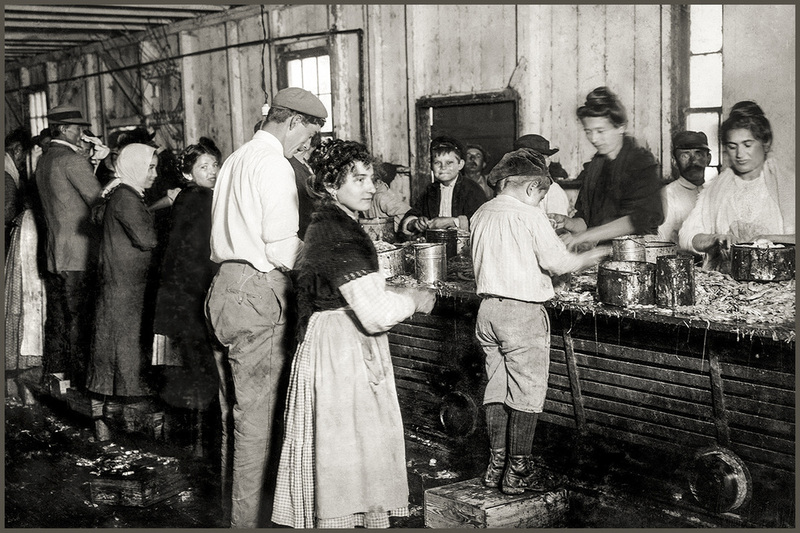 In 1880, the seafood industry was small and limited to what the local population could consume when the steam engine, new canning methods, and ice production changed everything. As the canneries sprang up along the coastal towns the factories found it difficult to find enough workers to do the degrading work they called 'shrimp picking'. 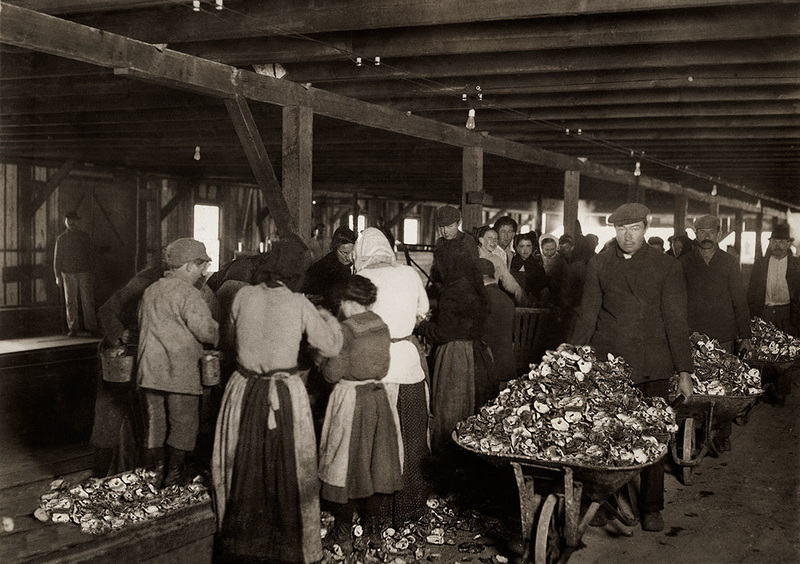 Eastern European immigrants known as 'Bohemians' traveled in special railroad cars from their homes in Baltimore to work the canneries along the coast during the winter oyster season . 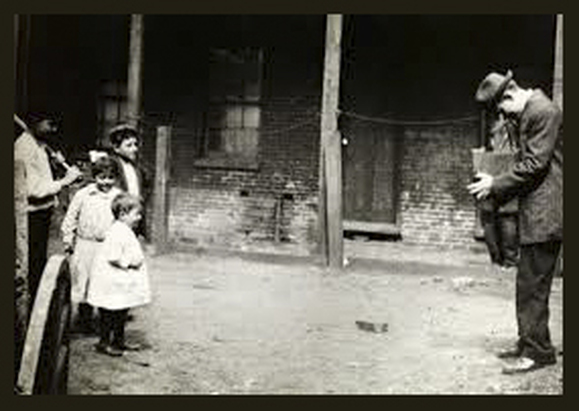 They lived in factory-owned camps near the canneries, and the children rarely attended the local schools. Many of the Baltimore families stayed on after the oyster season and became permanent residents. 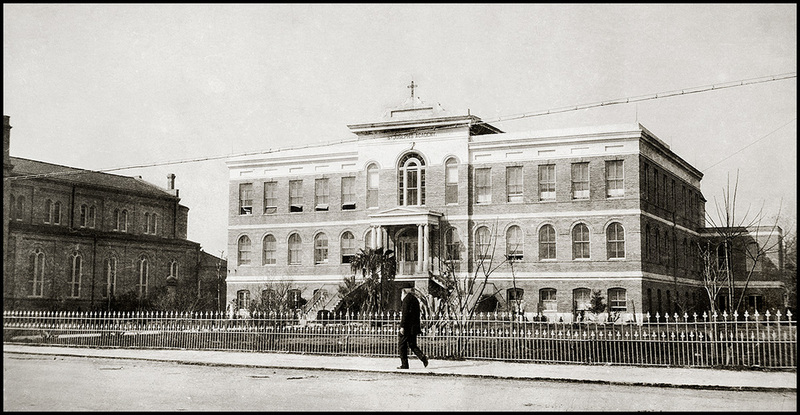 Another group of immigrants from Southeastern Europe known as Austrians settled along the coast during the 1880s. These immigrants were from a coastal region of Yugoslavia known today as Croatia. Many worked in the canning factories, but unlike the Baltimore families, many had specialized skills in boat building and seamanship. They were known for their strong work ethic, and great value on independence. Another immigrant group of seafood workers filtered in from south Louisiana. They were the decedents of Catholic French-Canadian settlers who were expelled from Canada. Like the Baltimore families and the Yugoslavians, the 'Acadians' branched out into many occupations along the Mississippi Coast related to the seafood industry. In more recent times, the seafood industry attracted another group of immigrant workers to the Gulf Coast, the Vietnamese. 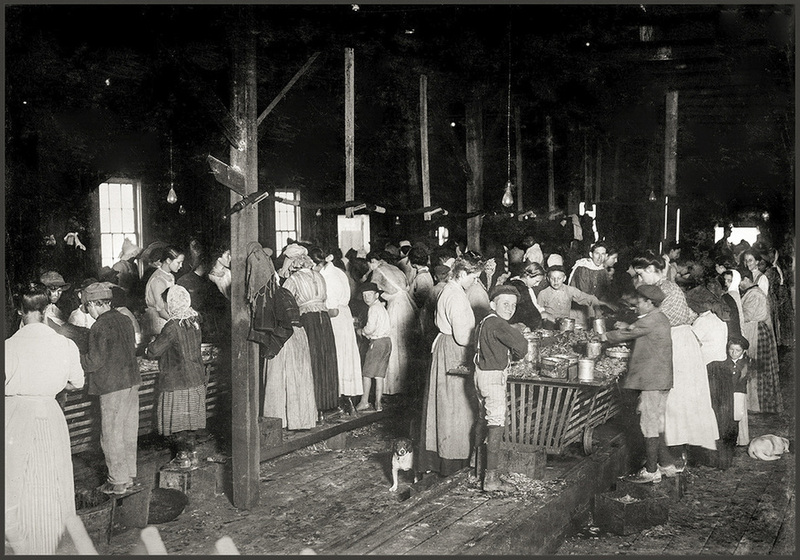 Editor’s Note: Lewis Hine used the term 'shrimp-pickers', as the local community did, as a generic phrase for all laborers in the seafood industry. 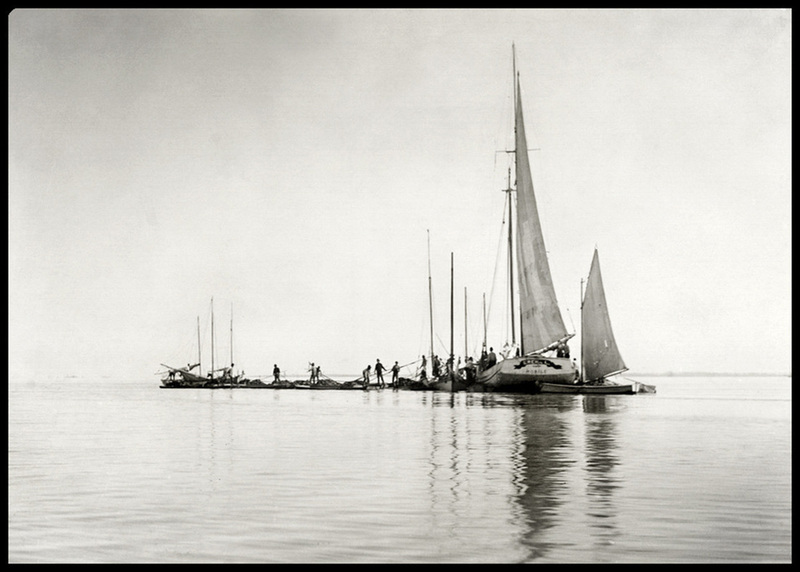 He photographed the Gulf Coast in the winter months during the oyster season. 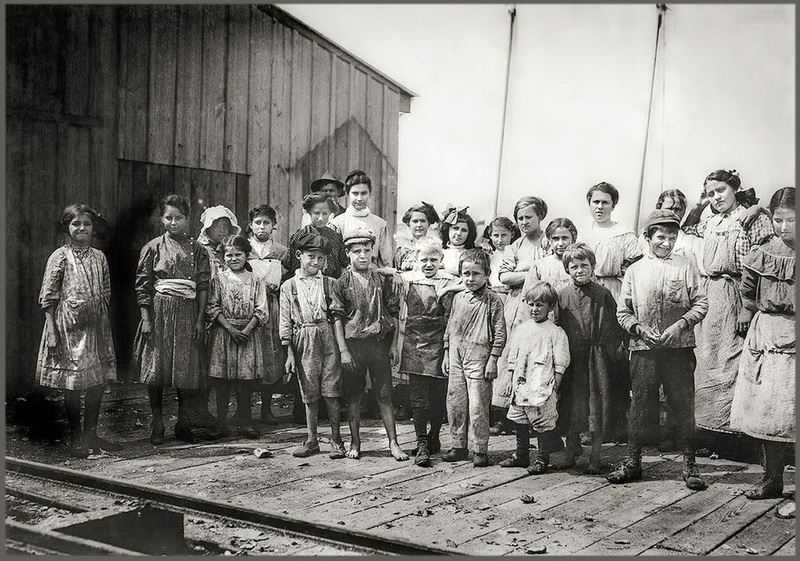 In the summer months these same children would be peeling shrimp or packing fruit and vegetables, although some of canneries closed in the summer. 10-year-old Jimmie. Been shucking 3 years. 6 pots a day, and a 11 year old boy who shucks 7 pots. Also several members of an interesting family named Sherrica. Seven of them are in this factory. The father, mother, four girls shuck and pack. Older brother steams. 10 year old boy goes to school. Been in the oyster business 5 years. Father worked for 25 years in the Pennsylvania Coal Mine, and the oldest brother there[?] They said they liked the oysters business better because the family makes more. On November 10, 1899, Lopez & Dukate advertised in The Biloxi Daily Herald for fifty boats to fish on the oyster banks and pay oystermen 40 cents per barrel of oyster. 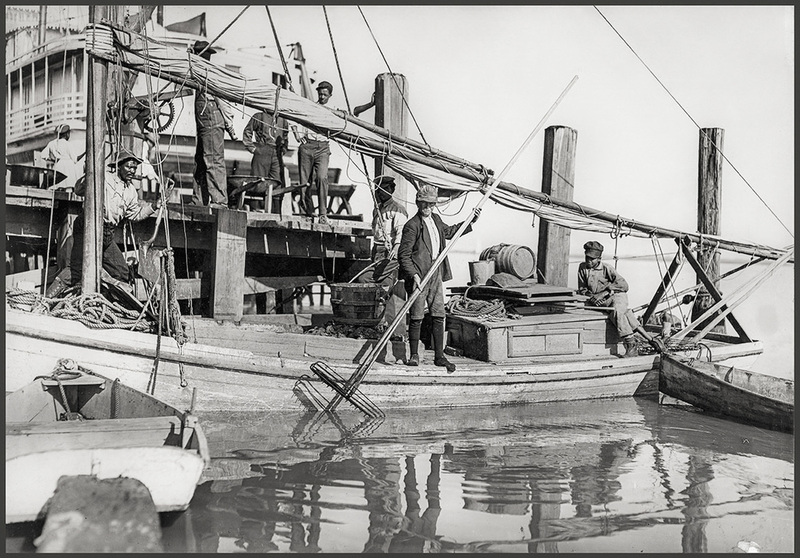 They would pay for fifty boats to transport oysters from the reef to the factory wharf for 40 to 50 cents per barrel. The factory also sought one hundred oyster shuckers. 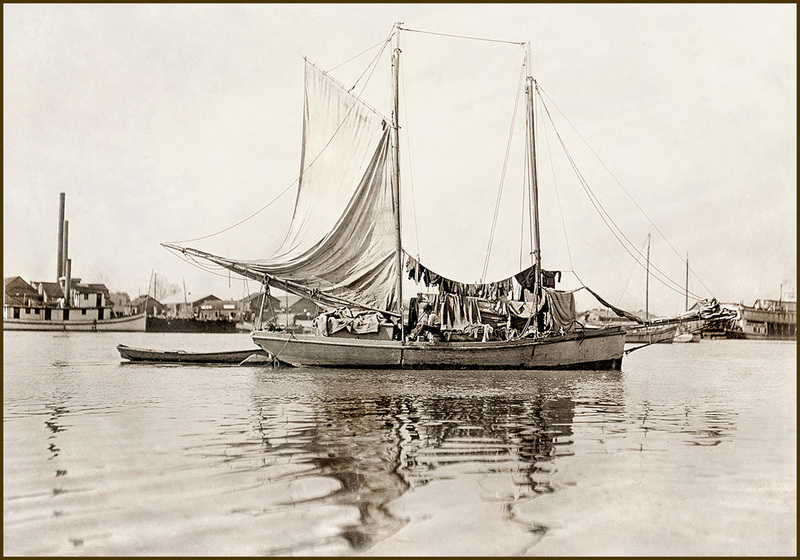 Oysters were first shipped out by schooner, in bushel sacks to nearby points. With the coming of the railroad in 1870, they were shipped by rail to new markets in Montgomery, Vicksburg, and Memphis. "Dunbar & Dukate oyster cannery. According to the testimony of a number of the parents and children, this factory reverses the child labor law to suit its own convenience, and probably to avoid detection. Instead of excluding the young children from work before six o'clock according to the law, they let the young children work from four until seven, and then send them home." ​Children who should have been in school. "Joe Davis, a ten-year old going home from cannery at 5 P.M. He said he had shucked ten pots since 4 A.M. that day."